DTS stands for Diversified Trading System. Think of a winning portfolio strategy on steroids. 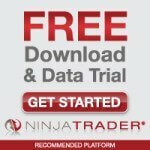 DTS for NinjaTrader scans hundreds of markets in futures, forex, and stocks for the best scalp, swing, and trend trading opportunities. DTS detects building opportunities, so you have plenty of time to get in at the right time. The best trades in every market at every moment for scalping, swing trading, and trend trading. Too many traders sabotage their success with too much. We cut the fat and built a balanced trading system that gives you the NinjaTrader tools for success. Our signals are quite simply the best you’ll find anywhere. 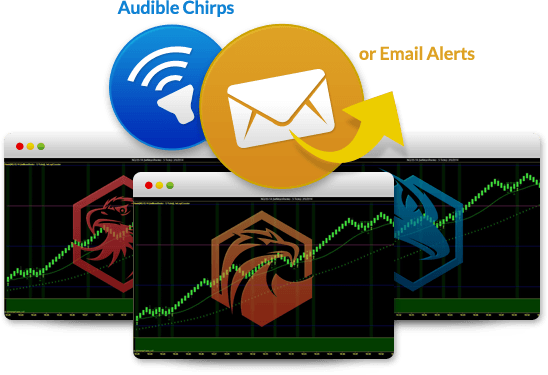 Professional traders use high-speed, real-time data, and so should you. Many "systems" and "signals" are based on historical data, and these other systems come with the U.S. Government mandated warning: "Past performance is not indicative of future performance." That’s a less reassuring warning. 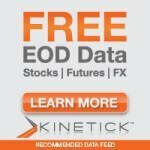 No one wants to deal with old data, With NinjaTrader's DTS, you work with real-time up to the second data. DTS Signals rely on 3 unique algorithms that give you your signals in stages. 1) The first is a dot that tells you a signal is developing. Get ready! 2) The second is a triangle. It tells you that the signal has been corroborated by two algorithms. Get set! 3) The third is a line. It appears at the best entry price, calculated for you by DTS. When the line appears on the chart, that means all three algorithms confirm that this is a high-probability signal. Go! DTS puts three entirely distinct systems in play for you simultaneously. We call DTS signal generators our "Birds." The Birds hunt for trades based on their individual specialties. You can see the differences in the chart at right. By using all three together, DTS gives you a balanced, professional perspective that can result in the best combination of accuracy, gain, and safety. Each strategy is valid on its own. The magic happens when ALL THREE STRATEGIES AGREE. Then you know you have a solid trade. DTS keeps all 3 Birds in the air simultaneously hunting for trades for you. You don't need to tie yourself to your computer screen. DTS Birds will "chirp" audible warnings for the "Ready, Set, Go" stages of every signal they generate. Or DTS can send you email alerts. You are free to do other things while DTS is scanning the markets for the best trades. Most DTS Traders wait for all 3 Signal Generators to flash "GO!" The next step is easy. DTS built-in LogiCounter module automatically sets the optimal Entry Price -- and that's where you'll see the slash on the chart. 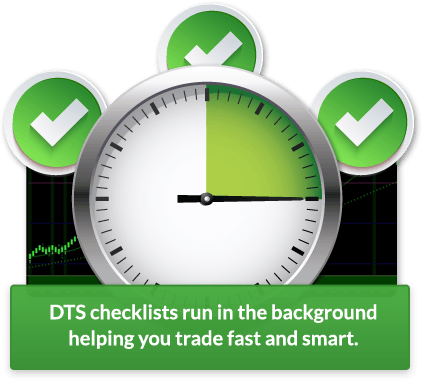 DTS helps you move quickly & decisively, so you never miss a trade. Staring at too many screens for too many hours is not the answer. It doesn't even begin to give you the essential information you need to answer multiple questions about every trade you consider. Every question you ask demands an accurate answer, and there not enough time for you to it all on your own. The evaluation takes time which is why we built DTS; it handles all of the details for you. Cut down multi-tasking so your focus can be better directed, and engaged. You can't "multi-task" your way to successful trading. There are too many questions and too many details for one person to handle. It is impossible to address every trading question and price calculation adequately. That's why we built the DTS, Diversified Trading System. DTS for NinjaTrader handles all the details for you. Saving you an immense amount of time. Only DTS shows you every important detail you need to trade faster than ever. DTS is a system of modules. 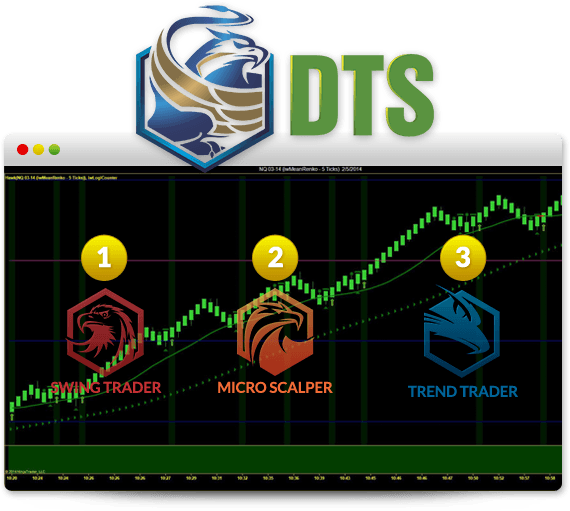 Each DTS module performs one particular trading task with absolute precision. It's like having your own "back room" of analysts & quants. For every trade, you take, multiple conditions must be met. You want a strong signal, safe position size, the right entry price, and sensible trailing stops. And when you finally have all of that worked out, then you can make the real decision, whether or not you should pull the trigger. DTS Modules Each Handle a Specific, & Necessary Trading Function. They work together, in the background so that you can trade fast trade smart. DTS Runs a Comprehensive Checklist in the Background. Automatically. Continuously. So You Don't Have To. DTS keeps you out of "trouble trades" AUTOMATICALLY. Position sizes, trailing stops, exits are all optimized, giving you not just good trades but SAFE trades. Staring at too many screens for too many hours is not the answer. You've heard the rule: "NEVER take a trade for an amount you can't afford to lose." There's no mystery to Position Sizing. The ground rules are well-known and agreed upon. However, few at-home traders will take the time to run the calculations and set their positions. And we understand. It's a tedious task, and we'd all rather be trading. DTS Trade Manager runs the calculations for you -- instantly -- on EVERY signal. You can't "multi-task" your way to successful trading. Some "retail" trading systems and strategies advise against setting trailing stops. Don't listen! They are appealing to your GREED. Even with all the computer systems, backroom quants & years of experience behind them, a floor trader, money manager or hedge fund trader will NEVER take a trade without setting the appropriate protection via a "stop-loss" order. Because there will always be losing trades - Period. Your sure-fire protection against excessive loss is the "trailing stop". DTS makes it easy to set your Stops -- and if you do, you will never get crushed by a killer trade again. DTS TradeManager tells you exactly where and how to set your stop orders -- to get you the optimal gain with acceptable risk. DTS puts three entirely distinct strategies in play for you simultaneously. The first thing you'll do when you install your DTS MasterTrader is to plug-in your settings for acceptable risk level with TradeManager. Then you can forget it. TradeManager runs automatically in the background and will keep you out of trouble on every trade. All you need to do is follow it's instructions that come along with every Signal. It's that simple. As your account size grows, you may want to review your TradeManager settings once every quarter. But, for the most part, you can rest assured that TradeManger is doing its job to keep your account whole, get the most from your trades, and keep you out of trouble. 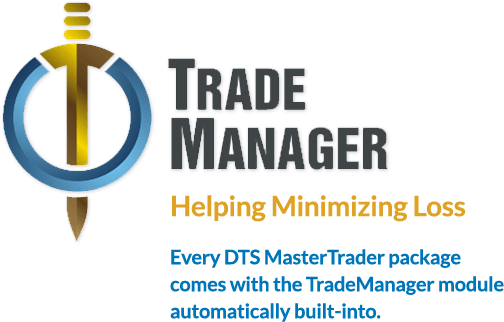 Every DTS Master Trader package comes with the Trade Manager module built-in. Most at-home traders know nothing about "position sizes" and "trailing stops", and the average individual's trading account "blows up" in 3 months or less. Professional traders learn the basics of money & trade management before they learn anything about the art of trading. The stakes are high, and preservation of the account capital is the absolute #1 rule.